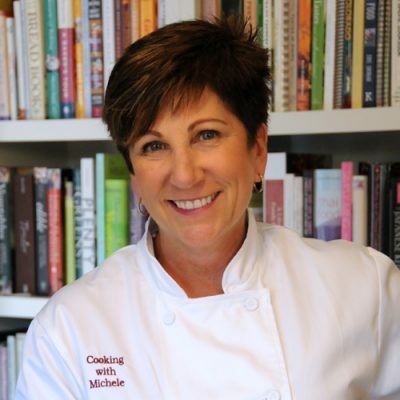 Cook with Michele in Italy! Have you ever created a recipe in your sleep? That’s exactly what happened to me the other night, as I struggled to remain asleep while adjusting to the time zone change after returning from Italy. As I tossed and turned, I was worrying over getting some new recipes posted before my surgery (I’m getting a brand new knee today! ), and thinking about the olive oils I had purchased on my trip. What I consider a miracle is that I still remembered this when I woke up the next morning, so I figured that was a sign that I should make these right away. Whenever I return from a trip, I’m a bit fixated for awhile on the dishes I enjoyed on my trip, the ingredients used, or the ways I might recreate some of those tastes at home. On this trip, I had enjoyed tasting this delicious lemon infused extra virgin olive oil from the Sabina Hills, and I felt I needed to make something with it. 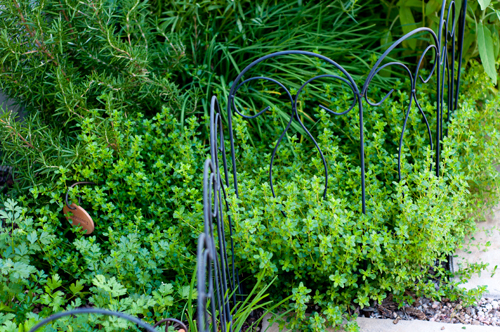 I also happened to have returned to exceptionally warm Colorado weather and my herbs, including this lovely thyme, were just bursting over the tiny fence I use to keep my dog out. Being not much of a baker, I rely on other recipes I’ve done before – other muffins or quick breads – to get the ratio of flour, leavening, liquids and fats correct in a recipe, then add in the special things I want. 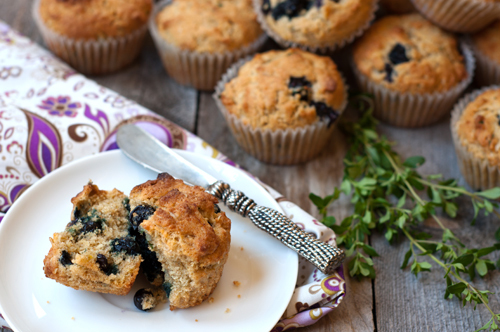 Lemon and thyme go great together, as do lemon and blueberries, so I figured the three of them would be happy together in this little muffin. Turns out I was right about that. I also found that getting ready to go in for surgery, knowing your activities will be limited coming out the back end, is a bit like nesting before having a baby. So putting a dozen or more of these muffins away into the freezer to keep me happy while recuperating just seemed like the right thing to do. I won’t be back in the kitchen for a bit, but not to worry – I’ll be sharing some of the recipes from my trip to Italy with you over the next couple of weeks, along with a couple of other things I’ve already made and posted. 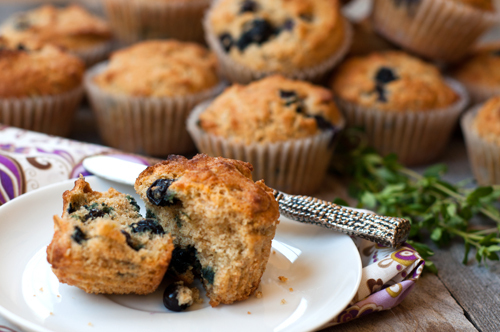 In the meantime, make these muffins. They are really good! Preheat oven to 375 degrees. Line muffin tins with paper liners and spray insides with baking spray. Stir together the flour, whole what flour, baking soda, baking powder, and thyme; set aside. Beat eggs lightly in a medium bowl and add butter, oil, yogurt and sugar; stir until well combined. 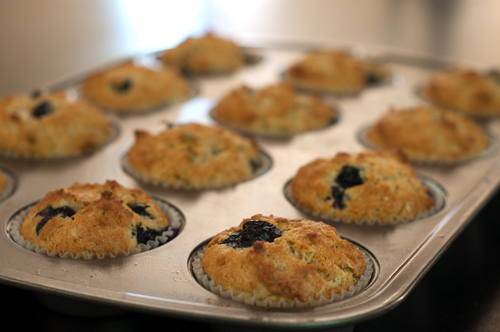 Pour into flour mixture and mix with a spoon until just combined, then gently stir in blueberries. 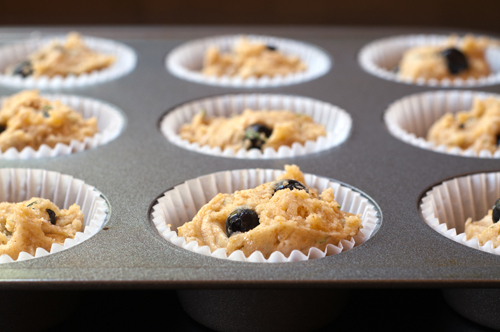 Scoop into muffin liners and bake until a toothpick inserted in the center comes out clean, about 15 minutes. Let cool before serving. 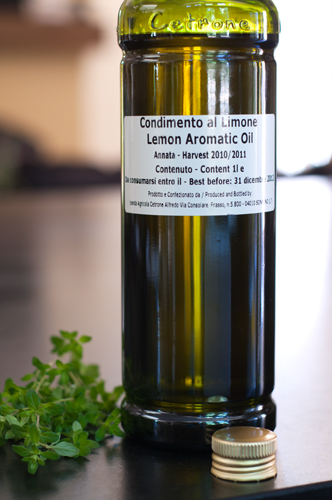 You can find lemon infused olive oils at most grocery stores, but you may also use regular olive oil and add the zest of 1 lemon to infuse the lemon flavor. Like this post? Get new post updates by feed or email. I HAVE thought of recipes in my sleep – but they never make much sense when I wake up – nothing like these, they look awesome! These muffins do look like a dream indeed. I hope you sail through your surgery and the recovery afterward. Let’s do have lunch when you get better. I’ll be thinking of you. I’ve never thought of a recipe in my sleep, but these look lovely! Well, I am nesting, with a baby due soon. I baked these today, but decreased the thyme to 1 teaspoon, as 1-2 tablespoons just seemed like it would overwhelm the muffin. I would keep it to 1 teaspoon, as it was a perfect hint of thyme & did not overwhelm the blueberries. I also added chopped walnuts. Best of luck with your surgery! Thank you for this recipe I make it once a month and LOVE it! I use almond, oat, chestnut flours and ground flax seed to make it gluten free and the texture is really nice. I love your use of lemon infused olive oil. I use one from Trader Joes that I love. Lemon Greek Olive Oil. I also add lemon zest. Thank you and I’ll have to look at your other recipe’s as well. Al the best. 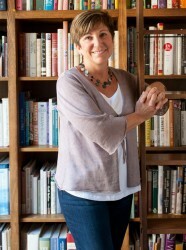 Enter code cookingwithmichele for 10% off your first order from Gustiamo! 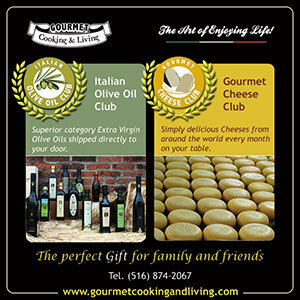 Join the olive oil of the month club from Gourmet Cooking & Living and enjoy high quality, authentic Italian olive oil every day!